Think of it this way: what is the first thing that you do when you meet a person? Do you straightaway start with the conversation? You begin with greeting him/her, right? The same holds true for emails too. Just beginning with the body of the email without addressing the person with a greeting, is awkward and even considered rude. The closing line is also something you should never miss out if you want to convey a positive emotion through your email. Just imagine leaving abruptly during a conversation and you’ll understand why. Another important point is to never use the phrase to whomsoever it may concern to address the person. It spells out your careless approach and the fact that you did not even bother to find out his/her name. When it comes to the tone of the email, there’s no thumb rule. You should take a call on how formal is just right, depending on the subject of the email and your relationship with the recipient. If you are well acquainted with the person, don’t resort to honorific titles, such as Mr. or Mrs. Instead, choose to address the person by his/her first name. However, it’s important to note that being too informal is not what most people recommend when writing emails. So, a “Heyy Edward!” may not be the right thing to start your email with when you’re addressing a professional acquaintance, even if you know him in person. Choosing “Hello Mr. Jones” would be a much better option here. A subject line is the first thing about your email that is visible to the user and it helps to build that all-important first impression. Also, it is the subject line that gives the recipient an idea about what to expect in the email or what it is all about. Goofing up with the subject line, thus, serves little purpose. When it’s an internal email, make sure the subject line is relevant to the email content. When you’re sending an email to a prospective client, make sure the subject line is catchy enough to create interest in your email. Using the ‘Reply all’ feature to reply to group emails, unless the context of your reply is relevant to everyone involved, indicates clumsiness and might be irritating to others. So, make sure you check the recipients’ box before you hit that ‘Send’ button. 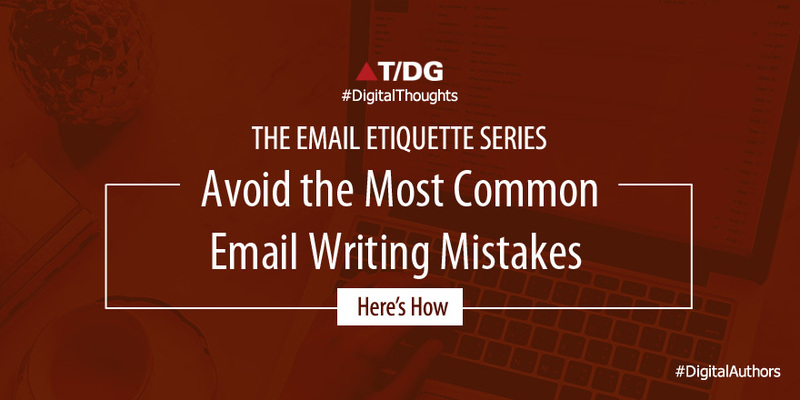 This is a small email etiquette that can make a difference and save you a lot of embarrassment. Just as they say, the little details matter and how! When drafting an email, make sure there are no silly typos and/or spelling mistakes. Make use of the Spell Check feature if required. Also, take some time to check the letter case wherever applicable and make sure there is uniformity in font colour, font type and font size. Paying attention to details shows sincerity and makes the recipient(s) feel important. There are few other email goof-ups to avoid and you can go through them too in order to understand where most people go wrong. Make a quick note of the pointers and refer to them when you set off to write your next email. If you have any other point you think email writers would find useful, do share with us. Thank you for sharing this informative and interesting article. Keep up the good work!